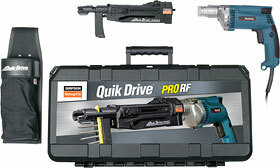 PRODUCT: Simpson Quik Drive PRORF Collated Screw Driver System. For Clay & Concrete Roofing Tile Attachment. Includes Makita® 2500 rpm screwdriver motor. Price/System.